After arrival at Lisbon airport we travel by road (40 mins) to the small fishing port of Cascais on the Atlantic coast – now a fashionable resort with a marina, smart shops, elegant restaurants and one of the best (and cleanest!) surfing beaches in Europe. After a short transfer to Lagoa Azul (Blue Lake), forest paths lead to open farmland and the Sintra-Cascais Natural Park, then down to Guincho Beach (extensive views! ), one of Portugal's best wind-surfing locations (7.9 miles, 4 hours). We follow coastal paths before heading inland into the Serra de Sintra, where we find hills with unique microclimates, known to the Ancient World as ‘Mountains of the Moon’, and the legendary retreat of Diana the Huntress (Cynthia to the Romans, hence Çintra). We visit the spectacularly situated 14th century Peninha Chapel, with fine painted panels depicting scenes from the life of the Virgin Mary, before returning along coastal paths to the hotel (6.5 miles 4 hours, 8.5 miles 5.5 hours or 12 miles 8 hours). We drive, then walk on paths with spectacular views leading to Cabo (Cape) da Roca, the most westerly point of Portugal – and mainland Europe. We then walk through the famous vineyards of ‘Colares’ where vines rooted in sand dunes produce ‘bright blue’ grapes used to make some of Portugal’s best red wines. We return to the coast and past dramatic cliff formations to the beach of Praia Grande, with its world-famous ‘swirling’ waves (7.4 miles, 4 hours). We continue along the coast to the small seaside resort of Azenhas do Mar, with its pretty whitewashed houses perched on a cliff. From here the coastal path continues, past more fine beaches, then heads inland to the curious church of São Mamede, ‘protector of the animals’ – which were freely allowed to enter the chapel until recent times. Minor roads then lead to Colares, centre of wine production in the area (9.9 miles, 4.5 hours). We walk through small hamlets and past historic quintas before joining wide forest paths leading up to the Convento dos Capuchos (Capuchin monastery). After visiting the monastery, we continue down through the Serra to the romantic Palace of Monserrate, with its extensive exotic gardens and follies. We then continue through the Serra and a short section of road brings us to the arch of the old west entrance to Sintra (8 miles, 5 hours). We walk to explore Sintra, recognised by Byron as ‘a glorious Eden’ and by UNESCO as a World Heritage Site. We find a ‘garden of delights’ with magnificent palaces, galleries, churches, museums, and cobbled medieval streets lined with boutique shops and cafés. We travel by road (1 hour) to Lisbon airport. If you would like an extension booking at either end of your trip please indicate this during the booking process and we will contact you with pricing information. 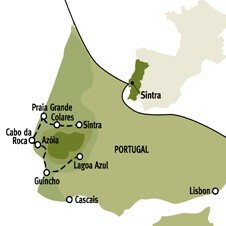 Paths along the Atlantic coast, through low hills, vineyards and forest. The fitness level of this trip is Grade 2-3. Delicious country cooking - hearty soups and roasts, with a strong reliance on sausage, cheese, bread and elaborate, fresh seafood dishes. Puddings tend to be sticky and extremely sweet – pastries and cheesecakes are favourites. The hotel in Guincho has a Michelin* restaurant. The windswept coastal area is home to the 'Ramisco' vines grown in deep trenches (technically underground) that produce the area's internationally renowned Colares wines. Another famous Portuguese wine worth sampling is, of course, Port. between coast and inland areas; therefore it is advisable to wear layers which can be added or removed en route as required. Please bring waterproofs. actual walking and does not include stops for lunch, sightseeing – swimming! walking boots with ankle support are recommended. 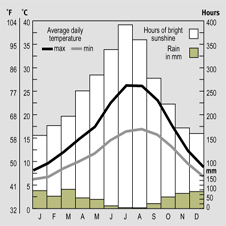 Please ensure that you have sufficient warm and waterproof clothing regardless of season. Some of our walks are very weather sensitive. If it is not possible to do a walk due to inclement weather, an alternative will be organised. Any such decision is at the discretion of the Tour Leader. a set meeting time at Lisbon airport for the transfer to the first hotel; a set time for the return transfer to the airport at the end of the trip; and a 'recommended flight' to connect with the airport transfers. Booking the recommended flight - which we strongly encourage - guarantees transfers to and from the airport, irrespective of flight schedule changes or delays. For clients not on the 'recommended flight' we cannot guarantee a transfer from the airport should you be delayed for any reason in meeting the group at the specified place and time. In this instance you will have to make your own way to the first hotel, at your own expense. The transfer to the airport at the end of the trip will also be timed according to the recommended flight and we cannot offer transfers at alternative times. Please check with the Reservations Team before making independent arrangements. You are of course welcome to meet the group at the first hotel. If you are meeting the group at the first hotel, our Tour Consultants will contact you on their arrival. On our escorted trips all meals are included. piri, black pepper, cinnamon, vanilla and saffron. Olive oil is a key ingredient in Portuguese cuisine, both for cooking and flavouring meals. Garlic is also widely used, as are herbs such as coriander and parsley. A common soup is the caldo verde with potato, shredded cabbage, and chunks of chouriço sausage. Portugal is a seafaring nation with a well-developed fishing industry and this is reflected in the amount of fish and seafood eaten. The Sintra coastline renowned for its fish stocks, in particular sea bass, cockles, mussels, clams, oysters and lobsters. Among fish recipes, bacalhau (cod) dishes are pervasive. It is said there are more than 365 ways to cook bacalhau – one for each day of the year. Traditional desserts are mostly rich, egg-based and flavoured with cinnamon or vanilla. The most typical desserts are arroz doce (rice-pudding) and leite-creme (a set egg custard).Cakes and pastries are also very common and most towns have a local speciality, such as the travesseiros (puff pastry stuffed with a sweet, gooey filling) in Sintra. Wine (red, white and "green") is the traditional Portuguese drink.We sample a selection of the local wines during the trip. Colares wine is the most famous of the area and is renowned throughout Portugal. Its principle grape variety is ‘Ramisco’ and the wine is unique in that it is grown in sand dunes, some 3-10 metres underground. Colares wine is very rich in tannins and so is left for a number of years to mature and develop in taste. Portuguese cuisine, as well as sampling some fine Michelin * and recommended restaurants. 'Smart casual' is the general guideline, however there are some smart restaurants on this trip where you may like to wear a jacket or skirt/dress. The destination airport for this walking holiday is Lisbon. There will be a set meeting time at Lisbon airport for the transfer to the first hotel; a set time for the return transfer to the airport at the end of the trip; and a 'recommended flight' to connect with the airport transfers. Booking the recommended flight - which we strongly encourage - guarantees transfers to and from the airport, irrespective of flight schedule changes or delays. For clients not on the 'recommended flight' we cannot guarantee a transfer from the airport should you be delayed for any reason in meeting the group at the specified place and time. In this instance you will have to make your own way to the first hotel, at your own expense. The transfer to the airport at the end of the trip will also be timed according to the recommended flight and we cannot offer transfers at alternative times. Please check with the Reservations Team before making independent arrangements. You are of course welcome to meet the group at the first hotel. Please indicate your intention during the booking procedure.